This versatile, all-in-one system is packed with features and power to spare. 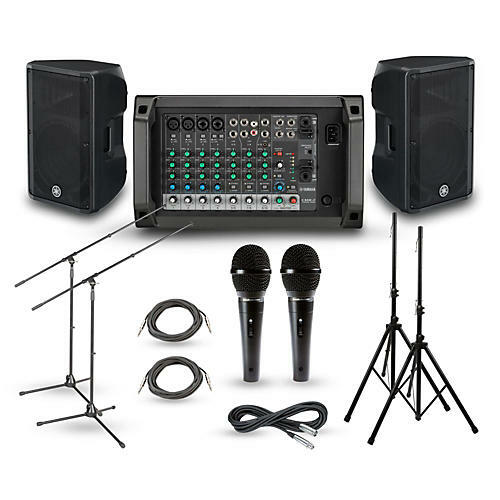 This potent yet portable Yamaha EMX2/CBR Series live PA package gives you plenty of power with the versatility to monitor and mix the perfect sound for your next live performance, plus all the accessories you'll need to hit the stage. Choose from either 10 in. or 12 in. speakers. Unbelievably lightweight and compact, this versatile mixer is the driving force behind the PA package, cranking out 2 x 250 watts of power. Designed for maximum performance and flexibility, the EMX2 offers 10 inputs and lets you connect up to 4 microphones simultaneously. Keep unwanted feedback in check with on-board feedback suppression. Drawing on decades of experience designing pro-grade speakers, Yamaha built the CBR Series to deliver uncompromising sound quality and portability in a versatile enclosure. Whether you choose the 10 in. or 12 in. model, you can count on 350W of continuous power handling and clear, unwavering sound. With its cardioid polar pattern, the M4000S offers amazing feedback rejection and focused pickup. Its frequency response is tailored for voice reproduction with a presence peak in the vocal intelligibility range. Featuring a convenient on/off switch, this all-metal microphone that is built to last. For a powerful PA system that fits in the trunk of your car, order today.